Spy Kids: Mission Critical – Season 2 (2018) – What's New on Netflix Canada Today! Finally feeling like a real team, the Mission Critical kids face their toughest test as they set out to destroy Golden Brain’s lair once and for all. The series centers around brother and sister team Juni and Carmen Cortez as they attend Spy Kids Academy, a top secret spy school for kid agents. 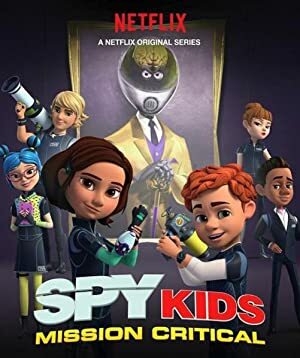 When a new counter-spy agency threatens the safety of the world, it will be up to junior spies Juni and Carmen to train and lead a team of fellow Spy Kids cadets against the forces of S.W.A.M.P. (Sinister Wrongdoers Against Mankind’s Preservation) and their diabolical leader, Golden Brain. The Mission Critical team may not be ready, but they are the only ones to call when grown-up spies can’t do the job.